I was working when Gary sent this picture to my phone. He had finished digging potatoes today! This is half of them. 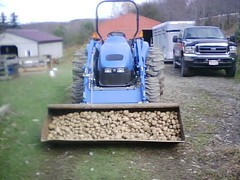 I see a lot of spuds for supper in our future! Posted in Garden. Tagged with digging+potatoes, harvest, potatoes.